You don’t have to write these documents alone. Ask your family, friends, teachers, or counselors for help. Part of the application process for many jobs is to complete an application form and some jobs may also require a resume. The information on an application form is often the same as what is on a resume, so taking the time to create a resume can be very helpful when filling out application forms. But writing a resume can be time consuming and a little scary. What do you include, especially if it is the first one you have ever written? Here are some resources that may help you through this process. My Perfect Resume is an online tool that can help you create a resume. Answer their prompts and you will end up with resume. Ready to apply for a job? provides tips on completing a job application. 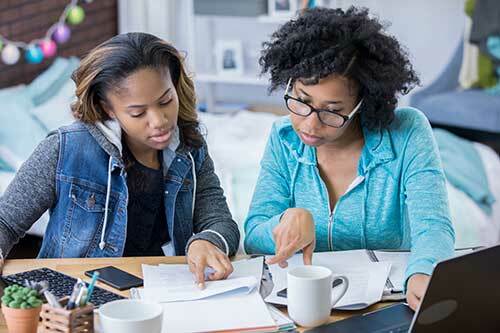 How to Get Your First Job (for Teens) tips from searching for a job, preparing a resume, applying for jobs, and interviewing. A cover letter is sent with your resume to provide additional information on your skills, experience, and why why you are qualified for the job you are applying for. Tips and Advice for Creating a Successful Cover Letter walks you through the steps of writing a cover letter. It also provides a template you can follow. CareerOneStop provides a template for writing cover letters. Congratulations, you’ve been asked to come in for an interview! Take some time to get prepared. Career One Stop highlight tips that can help you get ready for the interview.